Welcome to the CopyStorm/View Learning Center. In this area you will find articles explaining how to quickly create a database combining one or more tables from multiple CopyStorm backups. CopyStorm/View builds SQL which combines tables from multiple CopyStorm backups into a new database built from database views. Suppose an organization has three divisions: Americas, Europe, and South America. 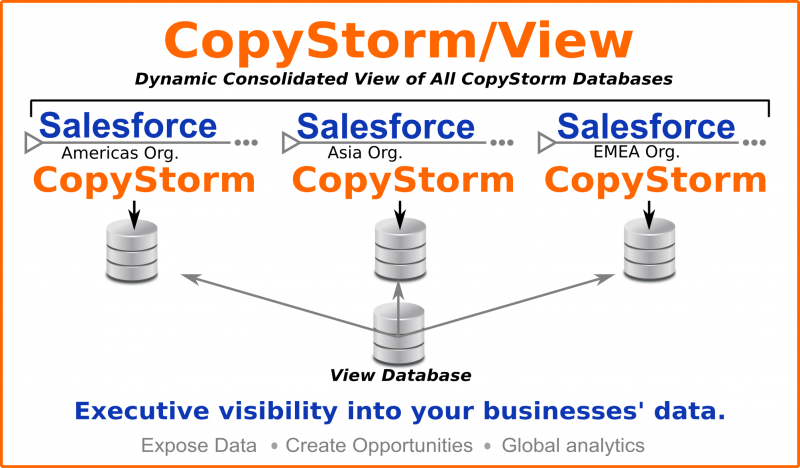 Each division has its own Salesforce instance, using CopyStorm for backups. The CEO is asking for daily reports on opportunity generation and wants to see it across all divisions.